Things that go bump in the night. That has often been a phrase used to describe the feeling of being suddenly awakened by a noise in the dark of night. Sometimes it’s just the wind blowing against a loose shutter, or a stray dog turning over a trash can. Sometimes it is not. These sounds in the night are the reason that we keep a bedside gun. Whether it is a forty-five on the table, or a twelve gauge in the corner, the purpose is the same. When the wolf is at the door, or already inside the house, the gun must be within easy reach. You are rudely awakened from a deep sleep, and have precious few seconds to react. "React" is the key word here, for you are responding to an act that is in progress. The intruder has had time, maybe even days, to plan the invasion. He is fully awake, and has a plan. He is almost certain that you are asleep, and has a pretty good idea of your location. He has been thinking about this. He has been sipping coffee, or snorting coke, and has been waiting for you to fall into a deep sleep. He has just about every advantage. By the time you hear that bump or the creaking of the floor, he is already inside. At the range, you can hit pretty well the paper target at 25 yards with your pistol, but how good are you at three in the morning, half asleep, across the room, in the dark? Let’s suppose that you are a good citizen who has decided to get your concealed carry permit. Your state has passed legislation allowing you to pay for the privilege to exercise your God-given Second Amendment rights. You took a class, submitted to fingerprinting and a background check, paid the wonderfully friendly personnel at the state office a chunk of cash, and finally received your permit. Now you can carry your weapon with a degree of hope that should you ever need to use it, at least you will not go to jail on a weapons violation. Maybe the instructor at the training class told you that you are most likely to be physically accosted or robbed at night, but I doubt it. It seems that most thugs in our society prefer to work the night shift. They love the cover of darkness. The dregs of humanity most likely will not bother you at a crowded Wal-Mart at noon, but prefer that lonely, dark parking garage to ply their trade. Cretins look for an easy target and the cover of darkness. When they attack, they like to surprise their victims, do their harm, and slip into the darkness. When you trained for your permit, you did pretty well qualifying. How will you do when three punks are coming out of the darkness at twenty feet, and closing fast? They have the advantage. Is your weapon within easy reach? Is it fully loaded and ready to fire? Can you accurately place your shots? Try this; go into a dark room of your house or outside at night, and try to aim your weapon quickly and accurately at something. You can probably see the target somewhat, but can you see your sights? I get email everyday from people who want advice on guns to resolve uncomfortable social situations, or in other words, to save their lives and the lives of the ones they love and have a duty to protect. 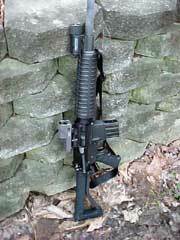 I try my best to offer guidance towards a gun that is best suited for their abilities and situation. I do not dwell as much upon caliber selection as I do on the ease and swiftness in which the weapon can accurately be brought into action. I would much rather carry a .22 Magnum that I can hit with under adverse conditions than a .454 that was too big and slow into action. Above all else, you must be able to hit your target quickly, and with a reasonable degree of combat accuracy. Every second counts, as does every shot. One of the best investments that someone can make is to get a good set of tritium night sights. They should be a factory option on any serious defensive weapon, but they are not. I have a Springfield 1911 .45 Auto on which good tritium sights were installed at the factory. It is a much appreciated feature of that weapon. 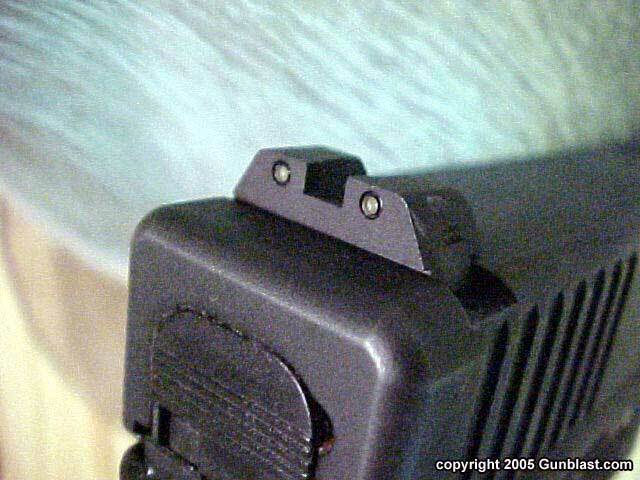 Most tritium night sights are of a three-dot pattern, and make a world of difference in the ability to place your shots in the dark. Most times, you can adequately see your target, but not the sights. 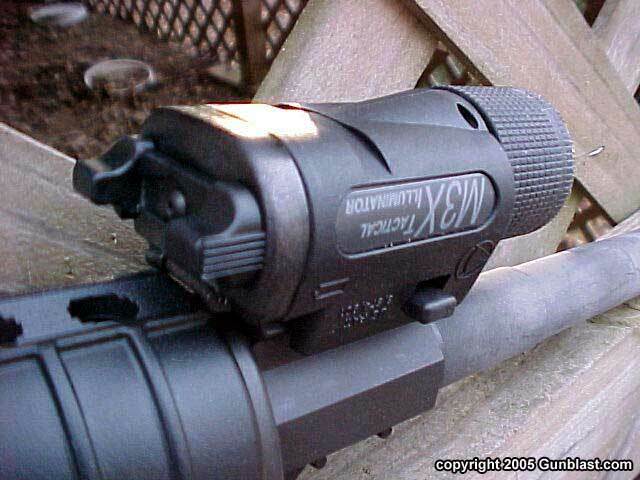 Tritium night sights make it much easier to align your weapon with the target, quickly, and they never need batteries. They are worth their weight in gold. I have on my S&W 342PD, a Big Dot sight from XS Sights that gives a quick reference point for the front sight, and works very well on that little pocket gun. On my larger framed autos, I have sights made by Meprolight and Trijicon. 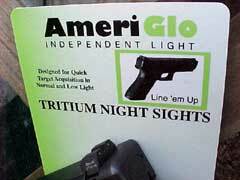 I have also recently tried out some tritium sights made by AmeriGlo of Atlanta, Georgia. All of these seem to be excellent sights. 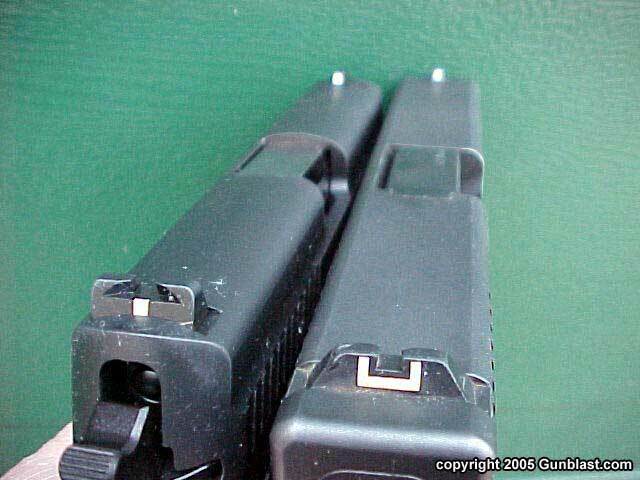 The tritium sights on my Glock 19 have been on that weapon for over eight years, and still glow as brightly as ever. I prefer a different color for the front sight than for the rear. 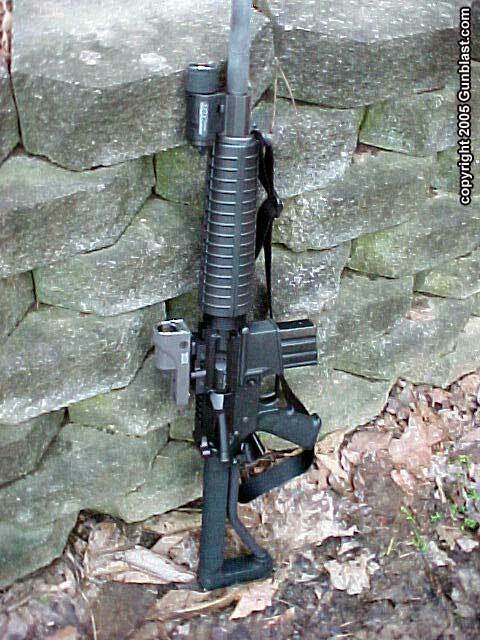 Any firearm that you carry for defense should have sights that you can see well at night, for that is most likely when the weapon will be needed. 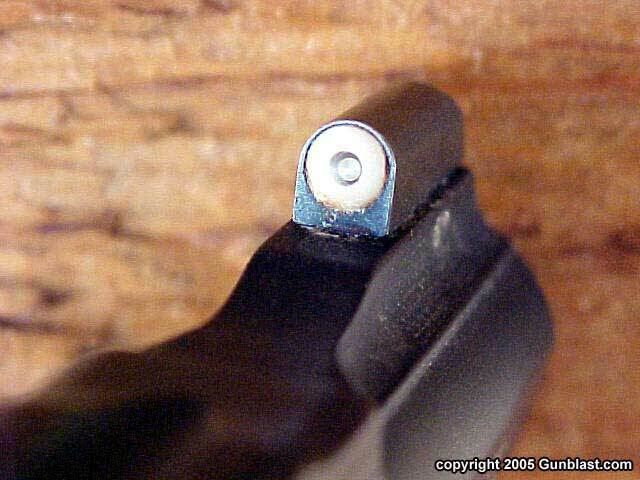 Any firearm that you keep by the bed should have sights that you can see in the darkness. The last thing that you want to do is to turn on the lights. 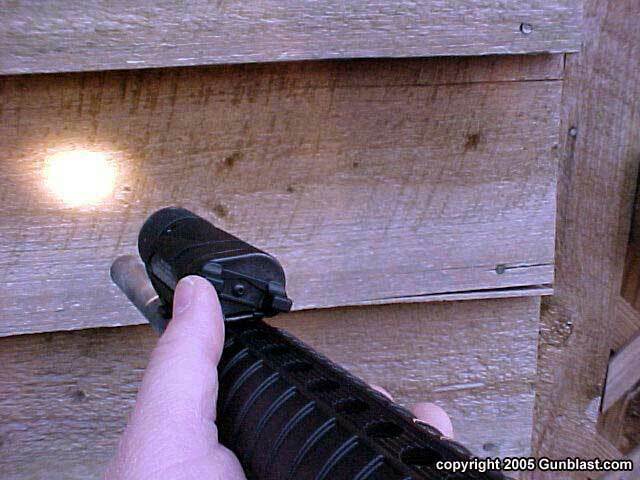 A good flashlight beside the gun or on the weapon can be handy for momentarily illuminating a room, but turning on the lights in a room that you have just entered is not a good idea. A quick flash to scan the room is preferred. Even then, a flashlight will give away your position, but is sometimes necessary. I have a powerful light attached to my Alexander Arms .50 Beowulf that has a momentary switch that will give a quick flash to identify a target or scan a room. The light can be easily bumped on for a quick look, or left on if desired. I prefer the quick flash. The light on my Beowulf is the M3X model made by Streamlight, and has proven to be very durable, and provides an extremely bright white light. Streamlight also makes a dandy rechargeable hand-held light, for those that prefer the light apart from the weapon, as I do with a handgun. 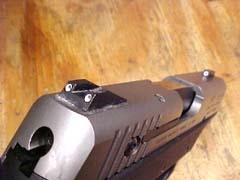 The weapon light attaches securely to any Picatinny rail and has different options available for the activation switch. 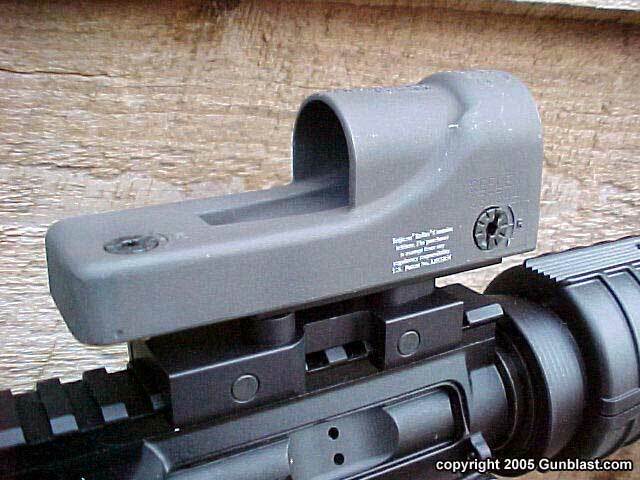 Also on the Alexander Arms Beowulf rifle I have a Trijicon Reflex sight. The Reflex is a red dot sight, but is always on, and needs no batteries. It uses tritium for the dot illumination. This is the quickest sight that I have ever used to get on target quickly, in any lighting condition, but especially in the dark. Both eyes are left open, and the weapon is brought to bear on target. It works great. 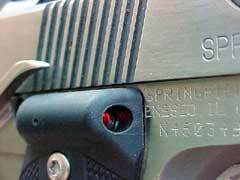 Lately, I have been trying out some laser grips from Crimson Trace Corporation (CTC). I will admit to being a bit slow to warm up to lasers on handguns, but they do have their place. I especially like them for training, as they allow a shooter to dry fire their weapon and see where the dot is on target when the trigger is pulled. 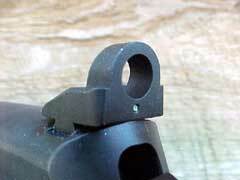 They also make for a quick aiming point on a target in the dark. CTC makes laser grips for just about any gun made that has replaceable grip panels. I even tried one on a single action Ruger pistol. While it looks a bit odd on that gun, I have to admit that it does work. In use, a switch is pressed on the grip, and the laser is projected upon the target. 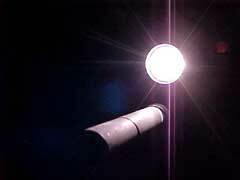 The dot is bright and easily seen, even at long range, depending upon the light conditions. The CTC lasers were easily adjusted for both windage and elevation to sight in on the target. All of these optional sighting devices listed are unobtrusive and are high quality products. They definitely help with accurate shot placement in poor lighting conditions; the kind of lighting conditions that criminals prefer. If someone accosts you in a parking lot or forces entry into your home, they already have the advantage of preplanning and surprise. You need every edge that you can get, and every second counts. I realize that this is not a pleasant topic, but a necessary one. I would rather test target guns and hunting rifles. However, there are those in our society that would do us harm, and for this we must be prepared to react swiftly, precisely, and with a vengeance. 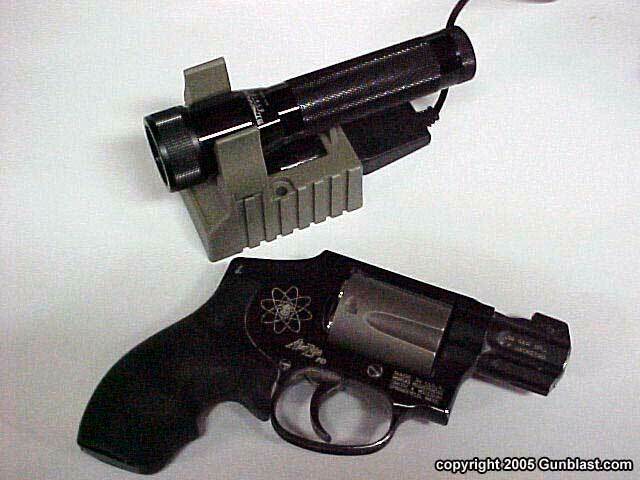 Two pistols in need of night sights. 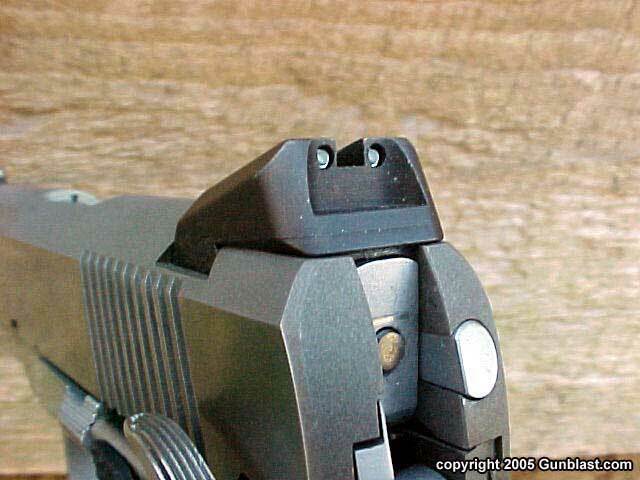 Author thinks any serious defensive weapon should wear a good set of night sights. 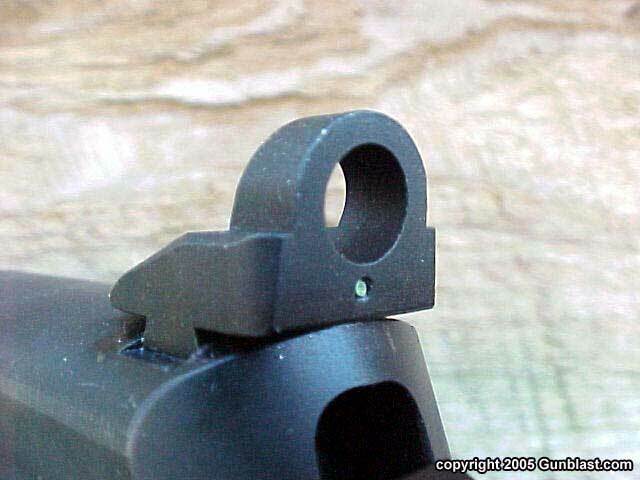 In the dark, white outline sights just don't cut it. 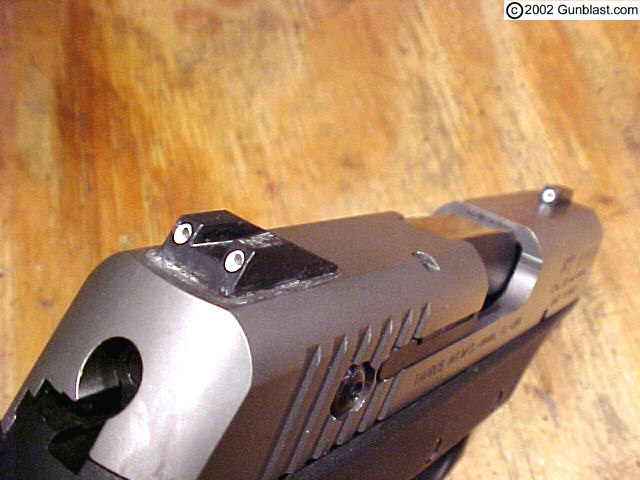 Factory-installed night sights on Jeff's Springfield 1911 (top) and Boge's Taurus PT111Ti (bottom). 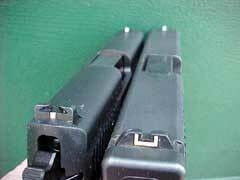 Such sights should be a factory option on any serious defensive weapon. 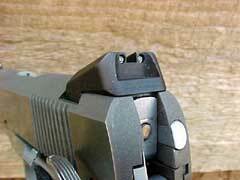 XS Sight Systems' "Big Dot" tritium front sight, mounted on Jeff's S&W 342PD. AmeriGlo offers a variety of tritium night sights. 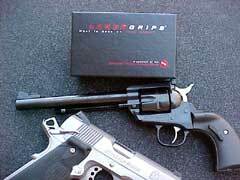 Crimson Trace offers a line of laser grips for a wide variety of weapons. These lasers are unobtrusive and useful in both defensive situations and training for basic marksmanship or defense. Jeff's Alexander Arms .50 Beowulf with Trijicon's excellent Reflex tritium sight and mounted Streamlight M-3X flashlight. Streamlight M-3X flashlight's controls fall naturally under the thumb of the forward hand for quick and easy use. The M-3X puts out a great deal of white light, which can both effectively illuminate the area and momentarily blind an attacker. 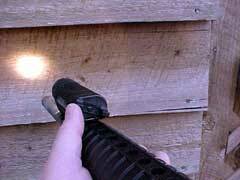 For defensive use with a handgun, Jeff likes the Streamlight rechargeable flashlight.